“hole in the floor” installation. sweet. These are so cool! I would love to have these in my house. 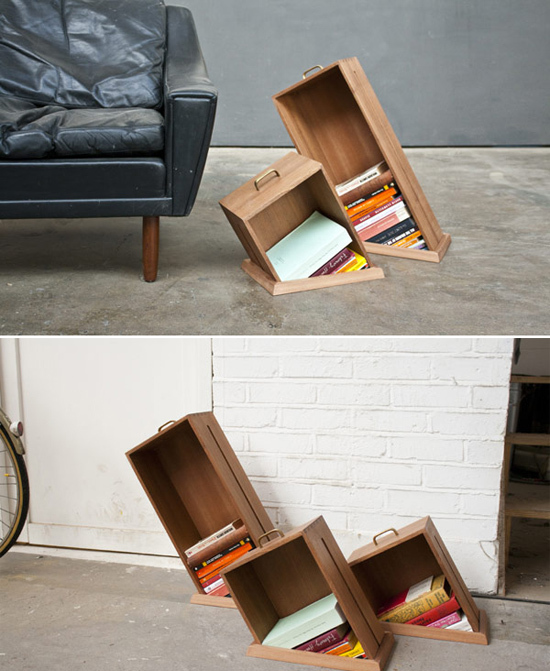 They are amazing–I would love to store my books in those. Very neat! Those would be perfect for a little quirkiness! what a fun little installation, quirky yet still nice an simple. Wow, these are so bizarre. I can’t tell if I love them or if they make me feel a little sea sick, ha. Very cheeky which I appreciate. Good share. these are amazing! even the books are crooked! those would make me laugh so hard every time i looked at them. love. love these! they make me want to pull the handle to lift them from the under ground. Pinning it as we speak! i want one of these!! they’re so cool! Loving the designer’s sense of humour. Those are so cool! Definitely a conversation piece! So rad! As a writer and editor, I would LOVE to have these for my office.